At Grammar, we believe it takes a team of passionate and dedicated faculty and staff to inspire the next generation of student leaders. Our employees play an integral role in creating and sustaining a vibrant, inclusive, and caring Grammar community. 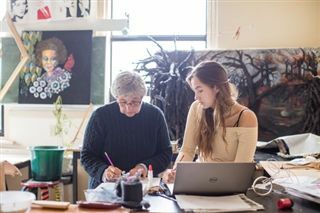 To ensure relevancy, we periodically benchmark our package with other public and independent schools within Nova Scotia. Doing so ensures that we are able to attract, hire, and retain the very best personnel for Halifax Grammar. Compensation packages include competitive salaries, a comprehensive benefits package, and access to professional development opportunities. Positions will be posted as they become available. However, individuals interested in joining our team are invited to send their resume to careers@hgs.ns.ca at any time. If you are interested in this opportunity, contact Erica Armstrong or Laura Godsoe at 1-866-822-6022, or submit your application online at: https://www.kbrs.ca/Career/12550. Teaching staff interested in substituting may forward a cover letter and resume to careers@hgs.ns.ca. We thank all candidates for their interest; however, only those selected for an interview will be contacted. "I'm proud of the work we do and the high standards we uphold at Grammar. Our kids leave here with a real sense of worth, and I'm privileged to be a part of that." "The passion and dedication among our staff is truly next to none, and I’m inspired to watch teachers go above and beyond daily to give children the best education possible."